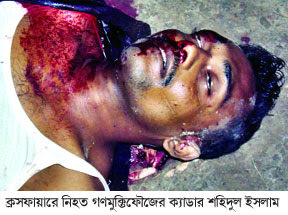 Death Toll 218 During Bangladesh Awami League Regime. By Bangladesh Media, The Daily Star reports that a member of Gono Mukti Fouz (GMF) was killed in a 'shootout' with police in sadar upazila of Kushtia early yesterday. The deceased was identified as Sahidul Islam, 30, of Bhadalia village of Kushtia sadar. Kushtia police said a team led by Assistant Superintendent of Police (ASP) Chokdar Abdul Halim raided Swastipur village on information that Sahidul and his aides were holding a meeting there around 12:15am. Sensing their presence, the outlaws opened fire on the law enforcers forcing them to retaliate, said the ASP. Sahidul was found dead on the spot after the gunfight though his accomplices managed to flee, he claimed. Police recovered one LG, 12 bullets and five bombs from the spot. According to Kushtia Sadar Police Station records, Sahidul was accused of six cases including two for murders. With this, a total of 11 'crossfire' incidents took place in Kushtia since January 1 this year killing 12 alleged criminals, which was not proven by the court. Today’s incident took to 218 the total number of people killed in incidents such as ‘crossfire’, ‘encounter’, 'shootout' or ‘gunfight’ after January 6, 2009 when the Awami League-led government assumed office. The Awami League in its election manifesto pledged ‘an end to such extrajudicial killing.’ 62 people have so far been killed since the High Court on December 14, 2009 asked the authorities not to kill any more people in ‘crossfire’ or ‘encounter’ until it hears a rule it issued suo moto on the government in connection with extrajudicial killing.